Opening Act: Tallying up the Syria votes. 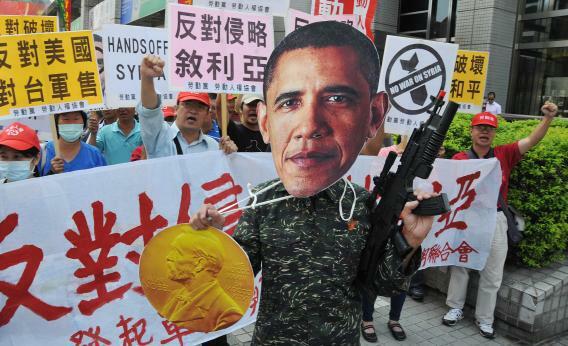 A labor group protester wears a mask of President Obama during a demonstration in Taipei on Sept. 9, 2013, asking him not to launch an attack on Syria. The New York Times beats everybody else in the Syria whip count game, collating statements from everyone, defining “opposition” narrowly enough so that only 154 members of the House and 18 members of the Senate stand against. The latest Quinnipiac poll in New York has Bill de Blasio on the cusp of a flat-out, no-runoff victory—he needs 40 percent, and he’s cresting at 39. It puts Anthony Weiner at 6 percent, which makes one question the news value of coverage like Today’s “exclusive” interview with the incredible imploding candidate. And former Slate columnist Eliot Spitzer is now 7 points behind Scott Stringer in the comptroller race. Eric Boehm finds that the most hawkish senators happen to be the receipients of the most defense industry donations. “It’s not exactly new information,” he says; but the information presented this way has been shared 5,000 times on Facebook. Philip Giraldi has some solid Syria questions. Ryan Lizza has the best summary of the Keystone XL battle I’ve seen, at least since BusinessWeek profiled Bill McKibben. And Norm Podhoretz insists that Barack Obama’s insufficiently aggressive foreign policy is part of a secret plan to turn America away from the incredible success that the neoconservatives would be enacting were they in charge.